I’m Not Perfect. ~So Why am I Here? Folks, I’m not perfect. I’m not perfect as a christian, I’m not perfect as a woman, and I’m certainly not perfect as a wife! I never claimed to be, and I’m pretty sure that you, my readers get that. Sometimes I have to wonder; “Just what I am doing here?” Who am I to think that I can write posts on marriage? Who am I to write posts on being an honorable wife, when it’s the one thing I struggle with the most? This marriage post that I write on Mondays… it wasn’t planed. I never intended to write a marriage blog. I started this site as a way to encourage and help women and wives who desired to become homemakers. Writing about marriage just happened. I started out by sharing our love story. Then I shared a lesson I had learned as a (very) new wife. Next thing you know, here is this Monday Linkup that hundreds of people are reading. On the weeks that I write a post (as opposed to sharing features) there are 100’s of readers here. Woman who are popping in to see what has been written about marriage this week. Y’all, it’s a bit scary at times. I know what I share isn’t that great, it isn’t anything new; and yet, somehow, someway, God is taking this poor offering and using it to HIS honor and glory. These marriage posts are sometimes the hardest ones to write. I feel so weak as a wife, so human as a woman. So how could I possibly encourage anyone else to do better? It’s not me here, I know it’s not. It’s God, using my heart and my hands to share encouragement. And that’s when it hits me. Those times when I feel like my life is worthless, it still has worth, because as long as I am submitting myself to the will of God, he is using me, and there is nothing worthless about being a tool in the hands of God. So to you dear wives and mothers, who feel your days are sucked up in caring for others, who feel like you aren’t doing anything to make a mark on the world or further the kingdom of God. Remember, you are a tool in the hands of God and he IS using you. Using you to mold the lives of the next generation. Using you to support your husband. Using you in ways that you will never know until you reach heaven. Tweet this -> So, I’m not perfect, and neither are you. And that’s the miracle. 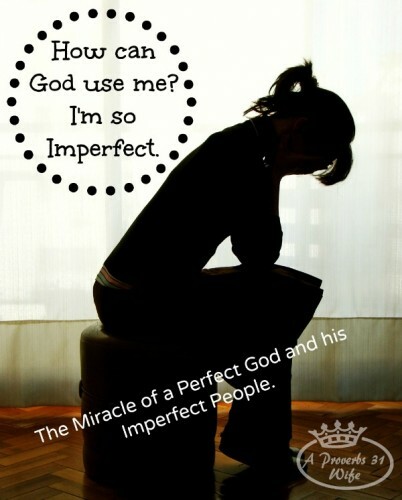 A perfect God, using imperfect people to create a perfect masterpiece! Thank you so much Kendra, for hosting! Kendra that was such a good post. I so totally know what you are talking about. I usually write about things that are on my heart and what I am working through at the moment or sometime in the past. Thanks for linking up with me over at WholeHearted Home each week. I am so glad you do as I get around to those who linkup with me the most and often do not get around to other places than linkups and linky parties. It’s wonderful that you allow God to use your story in this place and in the way, Kendra. Thanks also for giving us a place to meet each week! Thank you for your inspirational words! You are so right that God uses all of us imperfect people in such beautiful, amazing ways. It is exciting for me to continue to see how God uses me, especially when it is for things I see as impossible. I never set out to start a linky party either. I just starting doing a post every Monday on how to make your home “sing.” And then one of my readers suggested I make it a linky party so others could participate and here I am, lol! Thanks for hosting today. Yeah, they definitely evolve into things we never expected! That is hard. Showing the side that you don’t want anyone to see…. Found you thru the Time-Warp Wife, wonderful post! I felt uncomfortable today posting about the Great Commission because I know I don’t live it, but I felt it needed to be said, I needed to hear this today! Kendra, I’m glad you’re out there, giving inspiration to others, telling when it isn’t all blue skies and roses. Because there are days I get tired, and my skies definitely aren’t blue and my roses, well, they could use a little more bone meal, lol! When you read some blogs, it gets you very discouraged, because they make it seem like they have it all together, too perfect, if you know what I mean? You are a breath of fresh Spring air, and I am so thankful to you for that! Thank you for your kind words Sue. I definitely do NOT have it all together 🙂 Pretty sure no one else does either! Kendra, I have always been so impressed with your dedication to everything you love and value. I love seeing that you’re keeping up with your blog…no matter what sort of avenue it’s going to take. It’s so crazy how we plan to create something with a specific image in mind and then find it was never meant to be…that God intended it for something so different. You never know who your words will touch. He brings people around to the things that are good and nurturing for them.. how wonderful to be a part of that. I just began reading a book earlier this week by Brene Brown called The Gifts of Imperfection: Let Go of Who You Think You’re Supposed to Be and Embrace Who You Are. LOVING this book and learning to appreciate my imperfections a little bit more.